So how do you top a bunch of excavators playing the world's most massive game of Jenga? You put them to use doing what they were designed for: building stuff. 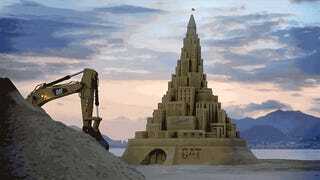 Except stuff, in this case, happens to be the world's tallest sand castle towering over 41 feet.